Mr Dionysis Stefanitsis and Mr Stavros Fostiropoulos (ESRs 8 and 9 from CERTH) visited the National Technical University of Athens to participate in a master thesis presentation event in order to inform the students about the general framework of the HAoS project and to introduce them to their individual research topics. Mr Stefanitsis presented information about the Horizon 2020 European Framework and also the Marie-Skłodowska Curie actions along with some details about the life of the homonymous scientist. He highlighted the scope of the European Training Networks (ETN) and the responsibilities of a Marie-Curie Research Fellow. Furthermore, he gave details of his research project on the subject of droplet breakup phenomena occurring in spray systems and accompanied them with corresponding videos, images and graphs of his current work. Mr. Fostiropoulos initially provided general information regarding the HAoS project: demographic data, the overall purpose of the project and the interaction between the selected ESRs. 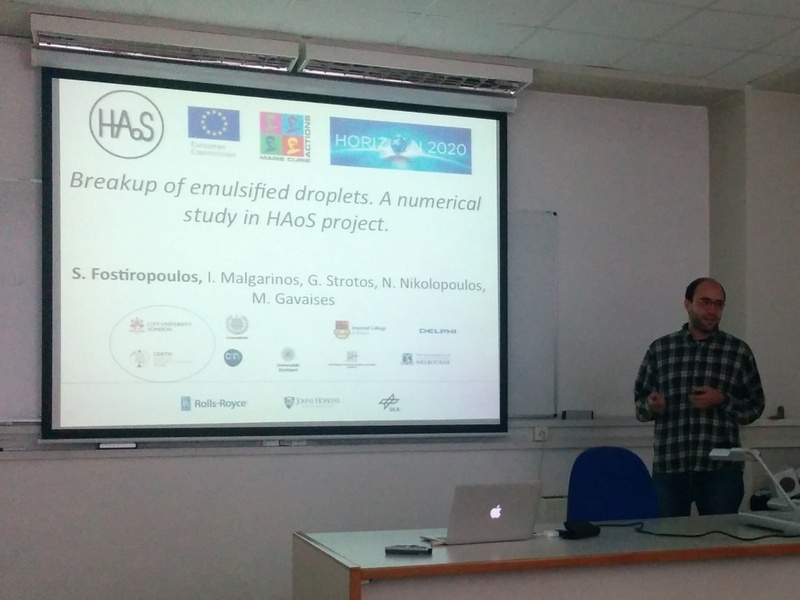 In the second part of his activity he presented selected results of his own research topic about numerical investigation of the breakup of emulsified droplets. Both ESRs received positive feedback on the research they have performed so far. The students showed great interest in the research conducted but also in the discussion between the ESRs and the academics in the field of Computational Fluid Dynamics. They also became aware of the Marie Curie actions social impact, as the CERTH research fellows didn’t miss the opportunity to point that out.